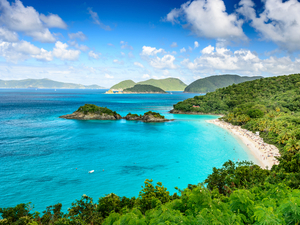 St. Thomas is a very modern, sophisticated island but has the secluded island charm and tropical feel. There are abundant shopping opportunities and the US dollar is used as well as English spoken. The island was purchased by the US from Denmark in 1917 for $25 million in gold (along with the islands of St. Croix and St. John). The island is located to the east of Puerto Rico in the Caribbean Sea. Sunny days and beautiful beaches, as well as great marine life, make sightseeing excursions and water activities very popular. 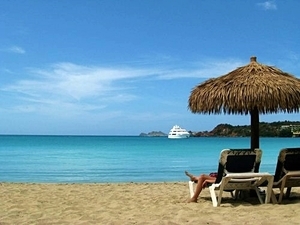 There are miles of beautiful beaches to explore such as on our St. Thomas Island Highlights and Beach Cruise Excursion. 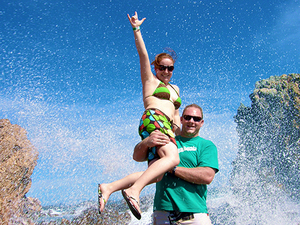 We offer the absolute best options for your tours and cruise shore excursions in St. Thomas! Round trip transportation from outside your St. Thomas cruise ship pier! 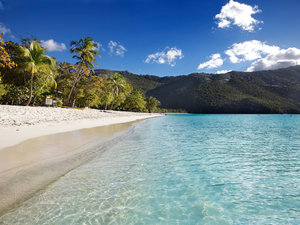 See Magen's Beach in St. Thomas! Spend 2 hours on the beach! 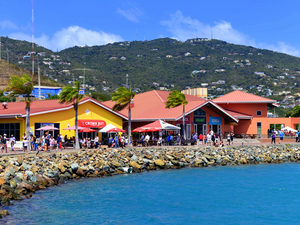 A guided excursion to see St. Thomas with island sightseeing, shopping and beach time. Round trip transportation from your St. Thomas cruise ship terminal! Fun open air sightseeing transportation! Complimentary refreshments such as soft drinks, juice and bottled water! A combo of Beach and Sightseeing-2 hours of each and one of downtown browsing! Enjoy a guided sightseeing excursion to see the best of what St. Thomas island offers. Discover the best St. Thomas highlights followed by beach time on one of the island's finest beaches! Private Roundtrip transportation from your St. Thomas cruise ship terminal! Air Conditioned, licensed and insured transportation! Private English speaking certified guide - specially chosen and trained! 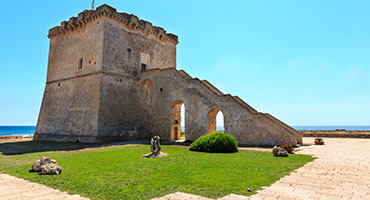 Scenic outlooks, historical stops, shopping and beach break! Picture opportunities all along the private sightseeing island excursion! 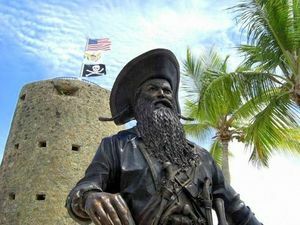 Visit the US Virgin Islands highlights from a comfortable air-conditioned vehicle with private guide and driver. 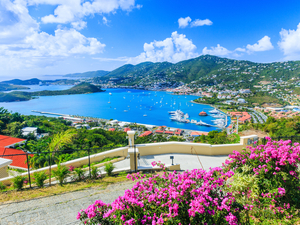 Gorgeous photo ops, taste the local flavors and spend quality time on a world class beach on this private St. Thomas cruise excursion service! Round trip sailing adventure on a 44 ft vessel! Meeting point at a convenient location! English speaking certified host and crew! Continental Breakfast, Lunch and Open Bar! Sail from St. Thomas to the St. John National Park! Small groups of maximum 6 guests! This six-hour full day sailing adventure will provide a relaxing day both on, and in, the warm waters of the Caribbean Sea. The natural beauty of these magnificent islands provides the perfect backdrop as the gentle breezes and sea mist calm your soul! Fun open air sightsee transportation! Free refreshments will be served while on this excursion! Round Saint Thomas island sightseeing! Enjoy plenty of free time left for other St. Thomas activities and excursions! Enjoy a guided St. Thomas island sightseeing excursion to see the best highlights of St. Thomas. This 2-hour sightseeing excursion will allow you plenty of time left for other activities or excursions in Saint Thomas! Round trip sailing adventure on a 44ft vessel! Complimentary snacks and open bar! 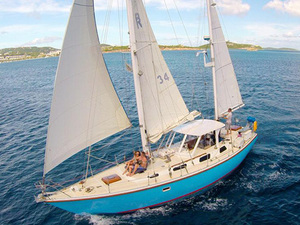 Sail the coastline of St. Thomas! Small groups with a maximum 6 guests! 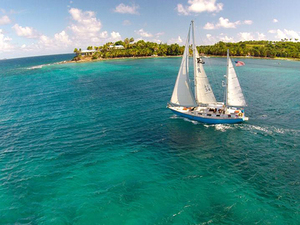 Sail through the coast with this intimate St. Thomas excursion. With only 6 passengers onboard you will have the opportunity to relax and admire the beautiful landscapes St. Thomas has to offer. Complimentary refreshments such as bottled water and soft drinks! 2 hours of guided sightseeing! Enjoy a great guided excursion of St. Thomas Island - see the best highlights and enjoy some shopping. English speaking shore excursion guides! All instructions and equipment - kayak, paddle, life vest! Supervision and assistance throughout the excursion! Picnic lunch from a local market! Free mesh bag and lockers! Snorkel set including Varied sized fins, sanitized snorkel, silicone mask, and vest! Complimentary cold bottled water and picnic snack lunch! Nature hike of Cas Cay Island with the guide! Get back to nature with this great St. Thomas Eco Excursion. We’ll take you to the Mangrove Lagoon where you get to kayak through the lagoon to a deserted island that has become a wildlife sanctuary. Enjoy snorkeling, hiking, and lunch as well (on 5-hour Excursion)! Round trip open-air private transportation from your St. Thomas cruise ship terminal! Private English speaking certified guide! Complimentary refreshments such as soft drinks and bottled water! Tailor make your day the way you want! Shop, Beach, Sightsee and more! This is a tailor-made St. Thomas Excursion - you pick where, what, and how long to explore and see the Island Highlights. 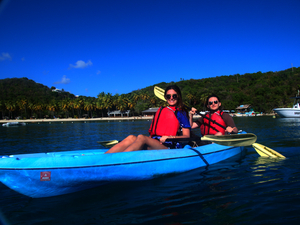 Guided kayaking shore excursion from St. Thomas cruise ship port! All instructions and equipment - kayak, paddle, life vest and snorkel gear! Complimentary cold bottled water and energy bar! Check out the wildlife at the Inner Mangrove Lagoon and Marine Preserve from a kayak on this St. Thomas Shore Excursion. Then explore the world beneath the surface by snorkeling through the crystal clear, and protected, waters of the preserve! Round trip transportation from your St. Thomas cruise ship pier! Fully licensed and insured transportation! Snorkel set including: Varied sized fins, sanitized snorkel, silicone mask, and vest! All necessary kayaking equipment included! Complimentary cold bottled water, snack, and picnic lunch on the beach! Second snorkel stop with tropical fish on coral reef! 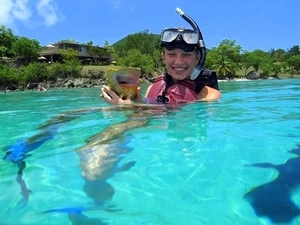 Kayaking from St. Thomas to Water Island, snorkel with the sea turtles, second snorkel with tropical fish and enjoy a delicious picnic lunch while taking in the natural beauty of the U.S. Virgin Islands on this unique shore excursion! Open-air safari style cruise excursion vehicle, fully licensed and insured transportation! English speaking and certified shore excursion guides and staff! 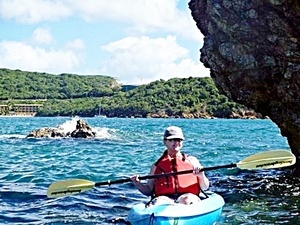 Guided kayaking excursion to Water Island - Honeymoon Beach! Guided snorkeling excursion with sea turtle in their natural environment! All necessary snorkeling equipment - mask, snorkel, and flotation vest! Digital pictures of your complete excursion included! Bottled water and snacks on the beach before snorkeling! Full complimentary lunch at beach restaurant (varied menu that includes salads, burgers, sandwiches and even vegetarian options)! We have the perfect half-day combo Shore Excursion in St. Thomas that combines kayaking and snorkeling with turtles along with time on famous Honeymoon Beach and complimentary lunch, too!